Lynn and I ate at Founding Farmers in Potomac, Maryland. The restaurant has gotten a lot of positive press particularly as a result of Michelle Obama listing it as one of her favorite restaurants. Indeed, there is much to admire about Founding Farmers; its attention to "green" practices such as recycling, and composting; its notion of using reclaimed materials in constructing the interiors and so on. As for the menu, there is great attention to the idea of using family farms and vineyards as the heart of the restaurant's offerings. In addition the FF site makes mention that they don't always gravitate towards local fare but try to be mindful and conscious about keeping their carbon footprint minimal. In addition, Founding Farmers is also located in Washington, DC and another is set to open in Tyson's Corner in early February. The Potomoc outpost had great interiors with a good looking bar and a charming hostess. We ate brunch there which is not typically our favorite meal. 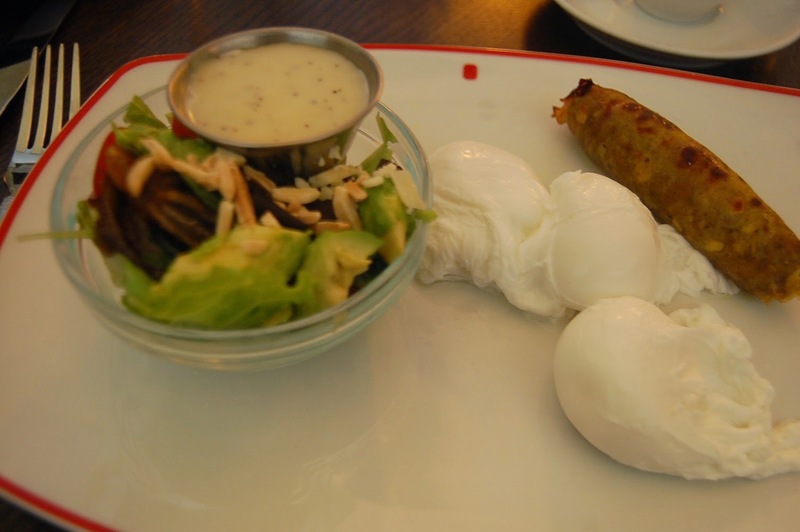 I had poached eggs, chicken apple sausage and a farmer's salad. 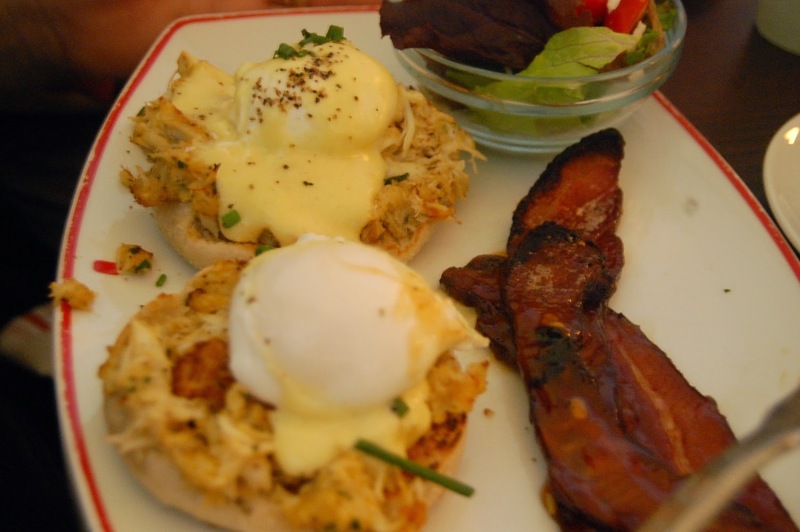 Lynn had Crab Benedict. Unfortunately, we found the food merely ok. My eggs were cold and the farmer's salad was a mess mixing olives and figs with an uninspiring dressing that seemed to be some sort of honey mustard. Lynn was happier with her Crab Benedict but it wasn't particularly memorable to her and the bacon accompanying her plate was slathered in what seemed to be syrup. The service was surprisingly ragged and uneven. We got menus and our order in quickly but the service deteriorated as the meal progressed. The staff was particularly slack in clearing our plates at the end of the meal. I will say that the "Corps Reviver" cocktail (with gin, absinthe, and lillet) was one of the best I have ever had. Surprisingly enough, with all of the trumpeting about the various farms and vineyards there was little if any mention on the menus about where the ingredients came from. We have been to other restaurants that wear there "green" credentials proudly so we were surprised there wasn't more of a narrative accompanying the meal. Chef Sean Brock of Husk Restaurant (located in Nashville and Charleston) has put together one of the most noteworthy cookbooks of the season: Heritage (Artisan). As the title indicates, Heritage makes much of Chef Brock's history and Southern upbringing particularly how this upbringing has influenced his culinary evolution. Heritage is an attempt to marry high end sophisticated cuisine and techniques with traditional comfort food which is a cornerstone of the Southern dinner table and diet. Some of the typical examples of this merge are Braised Lamb Neck with Tomato Conserve and Squash Seed Risotto. Many of the recipes are straightforward comfort food with a tweak or two to such as the Husk Cheeseburger which is pretty much a classic cheeseburger using plebeian American cheese and Duke's mayonnaise tweaked slightly by using ground flank steak and bacon for the hamburger meet and lemon zest for the "special sauce" accompanying the meal. Chef Brock's instructions are clear which is helpful since many of the recipes can be on the complicated side with a number of ingredients and steps involved. Heritage is so artfully put together that it could function as a coffee table book. The pictures by Peter Frank Edwards are beautiful compliments to the romantic quality of the text and recipes. Heritage is more than a mere cookbook. It also contains creative recipes for bitters, cocktails, as well as various blends, stocks, mustards, sauces and spices Chef Brock uses as foundations for his culinary work. There are also instructions about smoking techniques, pickling and preserving and even how to set up a Whiskey Cocktail Station for a party. Heritage is a very versatile cookbook particularly for the fall and winter months and it appears to be a breakthrough work on contemporary Southern Cuisine.